This episode made me laugh way to many times to count. Not much else to say that everybody else has said, but I still loved that call back to DekaRanger with Yuuko. Candelira's actress is always so gosh darn gorgeous whenever she's on scene. Out of all of the regular monster themes in Sentai, movie monsters are by far my favorite. The screwball antics they lead to are always good for a laugh, and it does so in a silly but still sensible manner. In this case both the police and school fights were a blast to watch, and I have to imagine the crew had fun filming them, too. Mecha madness next week. Yay! Aigallon is going to be pissed. 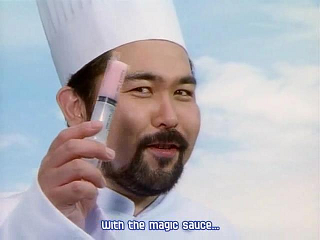 1) All of us DekaRanger fans knew it. IT IS JASMINE! 2) Shinkenger Returns: Cop/School cosplay. 3) Daigo's costume as a student. GENTAROU! Switch On! YAY thank you so much for all these cool references! 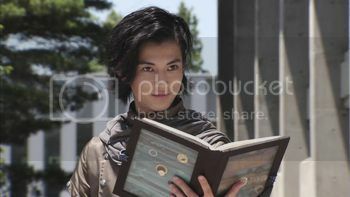 Speculation: Luckyuro & Candelira leaving Deboss like Torin = GekiRanger Finale 2.0? Overall great fan service for any Toei follower. There's even one for Fourze. Thanks Koichi Sakamoto! Heh. Honestly 90% of the things you mention probably fall under generic Japanese TV tropes, but it's nice that you were able to make all those associations. Amy, why can't you watch and read your stuff at your home instead of Spirit Base? Stop using your feet you lazy bum. Poor Ucchii. Just only need Dogold and Chaos's VAs to appear on camera now since Luckyrou's VA made her onscreen appearance. Candelira is an old woman since she probably have lived for centuries. Ramirez has found love in Yuuko. Strong Lady. And him cooking breakfast live they are living together was great. Man they didn't want to give Amy a weapon during the cop movie and Ucchii was ballin with the shotgun. Wasn't the "monster using something from your mind" thing originally from Ghostbusters? Haha, anyway, AWESOME episode, especially since I relate to Nossan most of all. All the good stuff mentioned, but... an unmasked roll call this early?! Man... I really don't want this series to end!!! 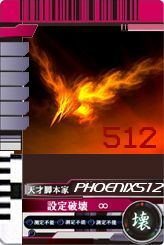 Phoenix512 wrote: Amy, why can't you watch and read your stuff at your home instead of Spirit Base? Stop using your feet you lazy bum. Poor Ucchii. JonSilver wrote: Wasn't the "monster using something from your mind" thing originally from Ghostbusters? Haha, anyway, AWESOME episode, especially since I relate to Nossan most of all. All the good stuff mentioned, but... an unmasked roll call this early?! Man... I really don't want this series to end!!! Oh yeah. I was totally thinking that while watching the episode but didn't think to comment on it. It would have been great if Amy responded with a "But I thought cop and high school movies were so harmless!" Man last year's super praised by everyone here Sentai seems to be already forgotten. As I said in the last episode's discussion. Ryuji was the focus of the Marriage Interview episode of Gobusters. I think it's more of a Blue member thing instead of a girl thing. Since Ryunosuke was in a wedding dress in Shinkenger. Speaking of earliest helmetless rolecall. Gobusters also did their first Episode 30 when they destroyed Messiah. Other than those two things. Best episode of the series by far, I really do hope we get a 3rd female member before the end. It may answer the question that was posed in the previous topic about the final rolecall. Definitely my favorite episode. I wasn't expecting a whole lot from it but now I'm eager to see what's coming next from Candelira. Hope she doesn't get killed off somehow, she's cute. They've already set precedent for Deboss monsters becoming good with Torin, and I just can't imagine they'd get rid of her or Luckyuro like that. The police/delinquent movie scenes were pretty funny. The "KYOURYUU GAKUEN" title splash and the Zourima with pomp wigs put a smirk on my face. The Jasmine reference caught me really off guard and I legit chuckled at it, which doesn't usually happen when I'm watching a show or whatever. Kamen_Rider_Shiki wrote: Looking back, I noticed fully that Yuuko was the one who made that melody, like Tessai's descendant from EP38. If I'm not mistaken maybe Ramirez and Tessai really will be training replacements in offscreen. Yuuko already has the strength to use Ramirez like a hammer. This is interesting, and I didn't give it a whole lot of thought until you said that. It would kind of make sense to see a brother/sister Blue/Cyan duo and if that's where they're going with it then it would actually make some sense that they stuck Ramirez at Yuuko's house for the whole episode (and potentially future ones, as far as we know). Just read the wiki, that old lady was Luckyuro's seiyuu?! LOL That's just awesome. Awesome. It's always great to know when people enjoy the content that we put on the wiki. I love finding out cool trivia stuff and sharing it with you guys. Great episode. Question though, when Candelira says "I've had my eye on you" and they have a real quick flashback, where is that flashback scene from? I didn't recognize it at all.